You drive a truck in Johnson County because of its spacious interior, towing capacity and rugged versatility as either a family vehicle or mobile office. Trucks have a specific set of maintenance and repair requirements, and not every shop is equipped to properly handle light duty truck repairs. 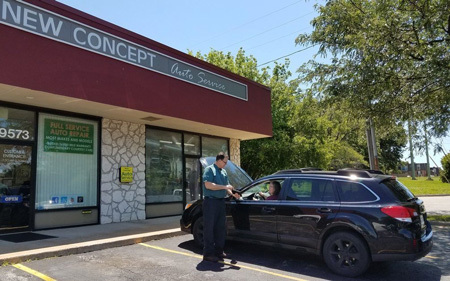 When you need light duty truck repairs in Overland Park, Leawood, Mission or anywhere else in Johnson County, visit the experts at New Concept Auto Service. We have 30 years of experience performing knowledgeable light duty truck repairs— while servicing our customers with a smile. At New Concept Auto Service, our ASE-certified master technicians know what it takes to maintain and repair your truck properly. With our professional-grade diagnostic equipment and repair tools, we can offer a full complement of light duty truck repairs on all makes. Whether your Nissan Titan requires an axle shaft replacement, your Chevy Silverado has transfer case problems, or your Ford F-150 requires a spark plug extraction, we do it all. Your light duty truck has heavy-duty responsibilities. We know you count on it to work when you need it, so we always use high-quality aftermarket or original equipment parts and fluids for light duty truck repairs at New Concept Auto Service. Honest. Accurate. New Concept. Call us or use our online appointment form to schedule your light duty truck repairs today! At New Concept Auto Service, you can rest assured that an ASE-certified technician is working on your light duty truck repair. We have the expertise and training to repair any concern that pops up, from fluid leaks to worn out parts. We perform light duty truck repairs on all domestic and import models, regardless of the vehicle’s age. We have the necessary diagnostic tools and the repair technology to efficiently and accurately perform your light duty truck repair right the first time. It can be inconvenient trying to coordinate your light duty truck repairs around your school classes or work, so we work around your schedule to make your visit as hassle-free as possible.